Please help us organize 2nd Islampur LGBTQ Pride Walk and Rainbow Mela in the month June 2018. 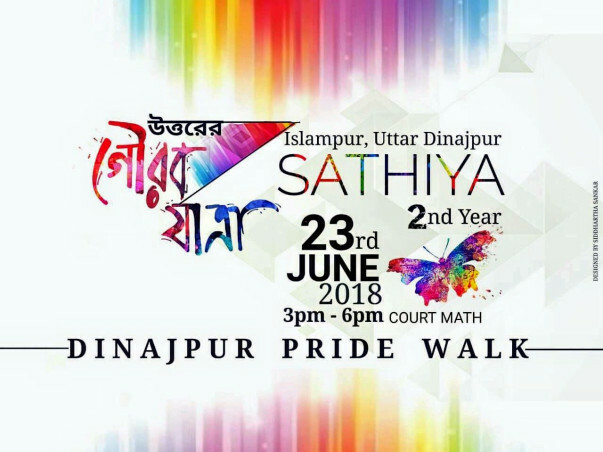 Dinajpur LGBT Pride Walk: On behalf of Dinajpur Notun Aalo Society, we are proud to announce the 2nd Dinajpur pride walk (Saathiya). This pride walk of northern Bengal district of North Dinajpur, is not only an assembly of some collective slogans but also about some free thoughts and dreams which will colour the dull paths with seven shades of the rainbow. We shall start our walk from Islampur court math on 23rd June 2018 at 3 p.m. The walk will continue till 6 p.m. We warmly welcome and request all of you to take a part in the walk. Your presence will add more colours to our journey. Dinajpur Rainbow Mela: Every struggle deserves a happy ending. There should be some cheers and glee. So we shall have our "Rainbow mela" on the next day of our pride walk. This will be a carnival of festivity and joy. The "Rainbow mela" is arranged at Islampur court math on 24th June 2018 (Time from 3 p.m. to 9 p.m.). There will be many stalls of colourful items. There will be some performances of the people belonging to the LGBTQ+ communities across West Bengal, which includes music, recitation, songs and more. About Dinajpur Notun Aalo Society: Dinajpur Notun Aalo Society (DNAS), founded in 2010 but registered in the year 2011, is a community-based organization primarily working for the rights of transgender, Hijra population and other individuals belonging to India's marginalized LGBTQI+ communities in the northern Bengal district of North Dinajpur, West Bengal. Some of its important activities are generating awareness around HIV/AIDS, gender-affirmative care related services, and various rights of the LGBTQ+ communities living in North Dinajpur, West Bengal. Apart from working with the communities on their health-related concerns, DNAS has also been organizing sensitization events with various stakeholders, including the government officials on the rights and other issues pertaining to the fundamental rights of transgender and other LGBTQ+ individuals. One of the major objectives of its work is to generate employment for the transgender and other gender-diverse communities in North Dinajpur and elsewhere. Last year, DNAS has organized the first-ever Pride March, Utter Gourav Jatra, in the history of North Dinajpur district, in which people across the state, and elsewhere participated to celebrate the diversity within the LGBTQ+ communities. Appeal for Help: In order to organize the second Dinajpur LGBTQ+ Pride and Dinajpur Rainbow Mela, please help us raise fund so that the already marginalized LGBTQ+ communities in the district of North Dinajpur can build up resistance against the violence and discrimination they face on the basis of their gender identity and sexual orientation. This is the end of the long wait! 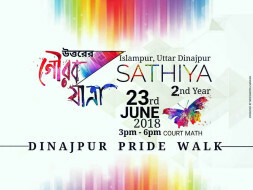 We are proud to announce the 2nd Dinajpur pride walk (Saathiya). This pride walk of north bengal is not only an assembly of some collective slogans but also about some free thoughts and dreams which will colour the dull paths with seven shades of rainbow. We shall start our walk from Islampur court math on 23rd June,2018 at 3 p.m. The walk will continue till 6 p.m. We warmly welcome and request all of you to take a part in the walk. Your presence will add more colours to our journey. Every struggle deserves a happy ending. there should be some cheers and glee. So we shall have our "Rainbow mela" on the next day of our pride walk. This will be a carnival of festivity and joy. The "Rainbow mela" is arranged at Islampur court math on 24th June,2018 (Time from 3 p.m. to 9 p.m.). There will be many stalls of colorful items. There will be some performances of the LGBTQ+ community people which includes music, recitation, songs and more. Your visit would make the Carnival more meaningful and colorful. Join us on this glorious event. My well wishes always with you. go ahead dear.